One by one, the items on Alaska’s wish list are being checked off as the first Christmas of the Trump administration nears. With Republicans appearing to gather enough votes in the Senate to secure passage of their tax overhaul bill, we could see President Trump signing legislation that will finally open the coastal plain of the Arctic National Wildlife Refuge. Also in December we’ll see Italian oil major Eni begin drilling exploratory wells into the federal Arctic Outer Continental Shelf from its Spy Island in state waters following the Nov. 28 approval of the plan by the Bureau of Safety and Environmental Enforcement. On Dec. 6 in Anchorage, the National Petroleum Reserve-Alaska bids will be opened after the Interior Department made all 10.3 million acres currently available part of the annual lease sale. That will follow the third-largest amount of bids ever received in the 2016 sale and reflects the commitment of the administration to unlock Alaska’s energy potential. 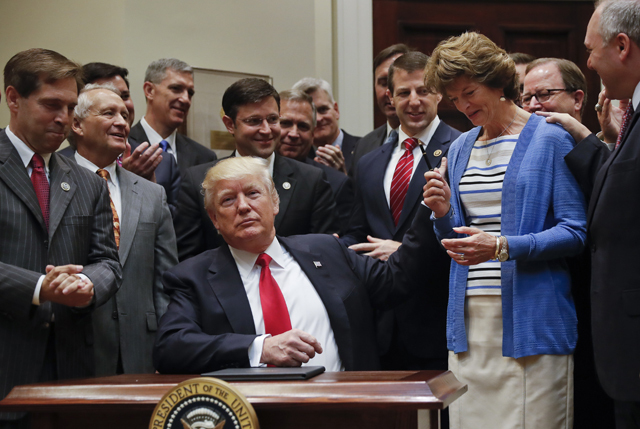 A less certain but potentially major development could also be forthcoming in Southeast as Sen. Lisa Murkowski — who has shepherded the ANWR legislation through the Energy and Natural Resources Committee she chairs — used her position as chair of the Appropriations Subcommittee for the Interior to revisit the 2016 Tongass Management Plan and to repeal the confounding Roadless Rule the state has been battling in court since 2003. That would be part of the fiscal year 2018 budget, but the uncertainty stems from the current continuing resolution funding the government expiring on Dec. 8 and the prospect of Democrats trying to leverage immigration reform for the so-called “Dreamers” into the negotiations. No state has benefited more than Alaska under the Trump administration, but that isn’t terribly surprising considering the federal government controls two-thirds of the land and nearly all the waters off our shores. What has been surprising is how willing leaders at the state and local level have been to squander the opportunities presented by the most friendly federal government toward Alaska seen in generations. Gov. Bill Walker and Democrat legislators have proposed multiple increases in oil taxes and supported the stop payment on tax credits earned and owed, which has directly led to lost jobs and production. Rep. Louise Stutes, the Fisheries Committee chair in the House and a member of the Democrat-led majority, is supporting both legislation and a ballot initiative that threatens development throughout the state of projects big and small. Permitting the Donlin gold mine or Walker’s gas pipeline could be impossible if Stutes’ bill or the initiative passes. Meanwhile in Anchorage back in August, Mayor Ethan Berkowitz held a fundraiser for Sen. Maria Cantwell, who is leading the fight against opening ANWR now after helping block it back in 2005. There were plenty of reasons for Alaska Support Industry Alliance CEO Rebecca Logan to run against Berkowitz in the April election, but raising money for an enemy of Alaska is good enough on its own. Former Sen. Mark Begich, fortunately replaced by Dan Sullivan in 2014 as part of the GOP takeover of the Senate, also hosted the Cantwell fundraiser and donated to his former Democrat colleague. While far friendlier to resource development than most Democrats (Begich was the lone voice in his party supporting Shell in Arctic exploration), if he decides to throw his hat into the race for governor his support of Cantwell will have to be an issue. At least Santa won’t have any trouble figuring out whose stockings deserve a lump of coal this year.